Sealaska Heritage Institute (SHI) will host an internationally-known Irish dance group at Celebration as part of its ongoing effort to promote cross-cultural understanding. The O’Shea-Ryan Irish Dancers group from Australia has been in existence for more than 60 years and performed in international festivals across the world, most recently in Iceland, Budapest and Montenegro. The dancers are attired in colorful costumes embellished with Celtic designs, and their lively energetic dances are performed to the toe-tapping music of traditional Irish jigs and reels, which are both lively and entertaining. Dancers’ ages range from the very young, to young adults and to the older young-at-heart performers. Some dances are performed in soft-soled shoes while others are performed in hard-soled shoes which beat out the rhythm to the music. One of SHI’s goals is to promote cultural diversity and cross-cultural understanding through public services and events, said SHI President Rosita Worl. “That involves sharing the Tlingit, Haida and Tsimshian cultures with the general public and sharing other cultures as well,” Worl said. 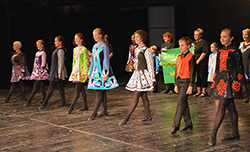 The O’Shea-Ryan Irish Dancers group is scheduled to perform at 7:10 pm, Thursday, June 9, and 7:15 pm, Friday, June 10, at Centennial Hall and at 5:10 pm, Friday, June 10, at the Elizabeth Peratrovich Hall. Caption: O’Shea-Ryan Irish Dancers performing in Montenegro. Photo courtesy of the O’Shea-Ryan Irish Dancers.